CNN has not yet reported on Stormy Daniels' statement claiming lawyer Michael Avenatti filed a defamation lawsuit against Donald Trump without her permission, despite the network's previously exhaustive coverage of the pair during their litigation against the president. "For months I’ve asked Michael Avenatti to give me accounting information about the fund my supporters so generously donated to for my safety and legal defense," she said. "He has repeatedly ignored those requests. Days ago I demanded again, repeatedly, that he tell me how the money was being spent and how much was left. Instead of answering me, without my permission or even my knowledge Michael launched another crowdfunding campaign to raise money on my behalf. I learned about it on Twitter. "I haven’t decided yet what to do about legal representation moving forward. Michael has been a great advocate in many ways. I’m tremendously grateful to him for aggressively representing me in my fight to regain my voice. But in other ways Michael has not treated me with the respect and deference an attorney should show to a client. He has spoken on my behalf without my approval. He filed a defamation case against Donald Trump against my wishes. He repeatedly refused to tell me how my legal defense fund was being spent. Now he has launched a new crowdfunding campaign using my face and name without my permission and attributing words to me that I never wrote or said. I’m deeply grateful to my supporters and they deserve to know their money is being spent responsibly. I don’t want to hurt Michael, but it’s time to set the record straight. The truth has always been my greatest ally." According to IQ Media and TV Eyes searches, Avenatti's name hasn't been mentioned on CNN since Nov. 22, when it reported LA County prosecutors had declined to charge him with a felony after he was arrested on suspicion of domestic violence. CNN has filed hundreds of stories on Avenatti and Daniels throughout 2018. No story about Avenatti has appeared on CNN.com since Nov. 22, however. The fiery lawyer and possible 2020 Democratic presidential candidate has appeared on CNN dozens of times over the past year in his representation of Daniels, who was paid $130,000 in hush money by former Trump lawyer Michael Cohen over an affair she claims to have had with the billionaire in 2006. This included an Oct. 16 interview where he was asked for his reaction to Trump calling Daniels a "horseface" in a tweet. 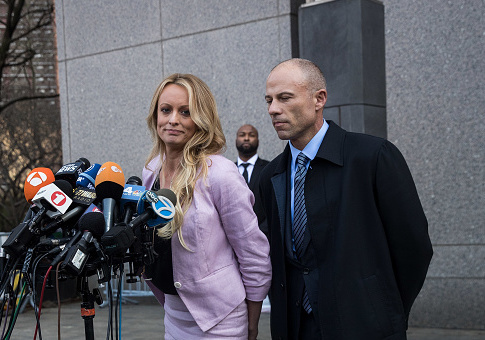 A federal judge dismissed Avenatti's defamation suit in October and ordered him to pay Trump's legal fees on the matter. Avenatti has also sued Trump to void a nondisclosure agreement Daniels signed over the alleged affair. This entry was posted in Politics and tagged CNN, Media, Michael Avenatti, Michael Cohen, Stormy Daniels. Bookmark the permalink.